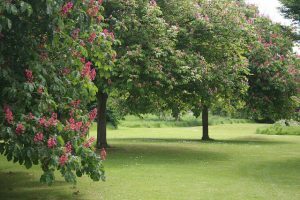 The name Horsechestnut comes from its use in ancient Turkey. Flour made from the fruit was mixed with oats and fed to broken-winded horses and is apparently still used today. During war time, the “conkers” were roasted in parts of Europe and ground to make a rather bitter coffee substitute. The fruit is rich in saponins which make a later in water. The were used in the past for washing clothes and to store clothes to prevent mold. Parts Used: The seed, leaves and bark. Active Constituents: Triterpenoid saponins (primarily aescin), coumarins and flavonoids. Tannin, starch, fatty oils. Aescin, the main constituent has anti-inflammatory properties. Seeds and preparations are toxic in overdose and exceedingly large amounts. Cases of severe poisoning have been reported mainly in children who have eaten the seeds. Symptoms include vomiting, diarrhoea, uncoordinated muscle twisting, dilated pupils, depression and possibly even paralysis.